Questions? Call 1.800.322.5003 or email us. 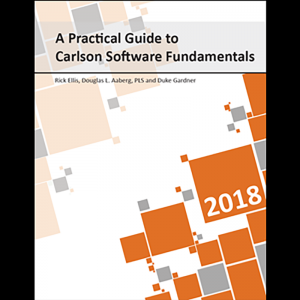 Welcome to the next generation of training materials for Carlson Software, the Practical Guide. The Practical Guide books have been formatted to maximize learning by starting all lessons with an explanation of the concepts and processes that will be covered; followed by real world examples in step-by-step exercises that you can perform yourself with the included dataset. 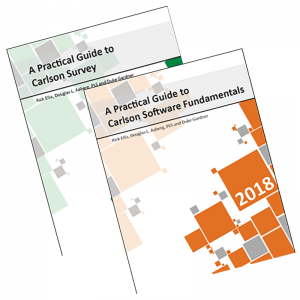 Carlson Software offers an extensive product line of desktop software solutions including Carlson Survey, Carlson Civil, Carlson Hydrology, Carlson Mining, Carlson Takeoff, Carlson Construction, and many more. While each of these applications has their own set of unique tools and functions, they also all share an extensive set of tools for setting up projects to store and organize project data, working with point data, working with digital terrain models, exchanging data with various other formats, as well as basic CAD drafting, editing and labeling functions. The mastery of these areas of commonality between all the Carlson desktop applications is the focus of this book. A Practical Guide to Carlson Software Fundamentals 2018 features 80 exercises organized into 34 lessons in 6 chapters. Each lesson includes detailed descriptions of processes and theory with many illustrations and diagrams, to help you understand “why”, not just “how”. A Practical Guide to Carlson Survey 2018 features 83 exercises organized into 37 lessons in 7 chapters. Each lesson includes detailed descriptions of processes and theory with many illustrations and diagrams, to help you understand “why”, not just “how”. This new, large format book is spiral bound, to lie perfectly flat on your desk. This new Carlson 2018 books focuses on effectively using this powerful software, providing you with skills that other professionals are using in the workplace every day. Instructors: this book is used in classrooms worldwide. Find out more about using it in your next class. Connecticut Association of Land Surveyors, Inc.
© 2019 Maine Technical Source.